The British Junior Open squash championship is considered the second most prestigious junior open squash championship in the squash history after the World Junior Squash Championships. Congratulations to Egyptian junior Kareem Badawi for making the final podium in the B13 division of the British Junior Open. Kareem placed 3rd in the 2018 event in Birmingham, UK. Kareem's racket of choice is the Feather Super Hitter. We are back with our friends at Arroyo Seco Racquet Club (South Pasadena, CA)! Join us next month for The 2017 Feather Racket Sports Junior Silver Squash Championships. This tournament has been accredited by U.S. Squash so the competition is guaranteed to heat up. Mark your calendars, The Arroyo Seco Racquet Club and Bob Hanscom Squash Academy are hosting the event Friday November 17- Sunday November 19, 2017. See you there! 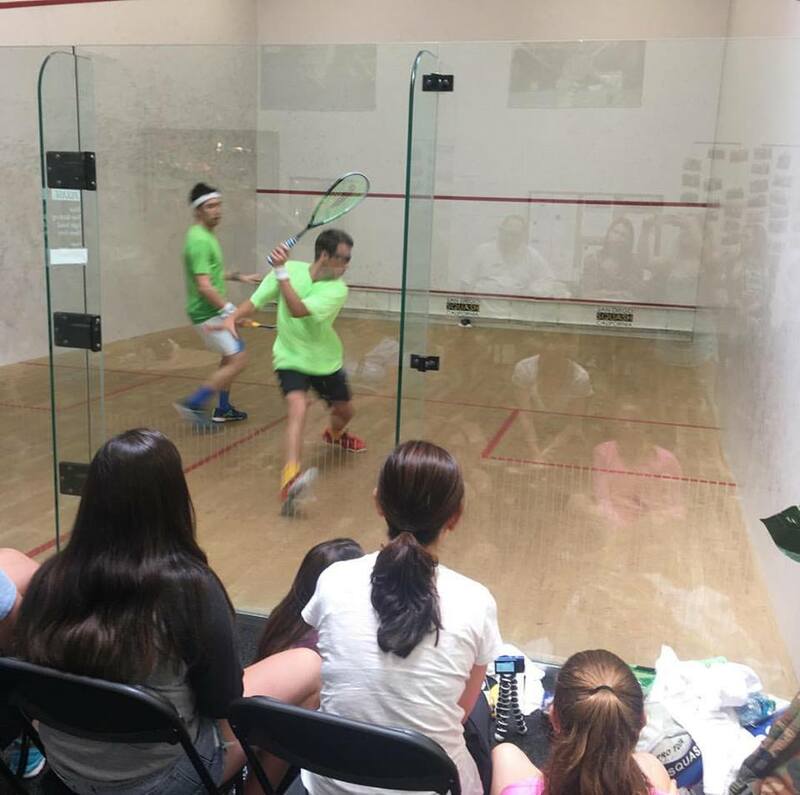 Last weekend Equinox Sports Club Orange County hosted The 2017 West Coast Regional Junior Squash Championships. Junior players from California, Washington, Oregon, Arizona, and New Mexico congregated in Irvine, CA to participate in this tournament. Representing the Arroyo Seco Racquet Club, Eric Lin was the runner up in the Boys Under-15 Division. Eric is currently ranked #8 in California, with a 4.19 rating in the Boys U-15 Division. In his young three-year career, 14 year-old Eric Lin has already won three bronze and three silver tournaments. Representing the Arroyo Seco Racquet Club, 14 year-old junior Makayla Oas won the 3/4 playoff in a Men's Division at the Irvine Adult Squash Tournament this past weekend. Makayla will be playing up an age-group in the Girls U-17 Division at the U.S. 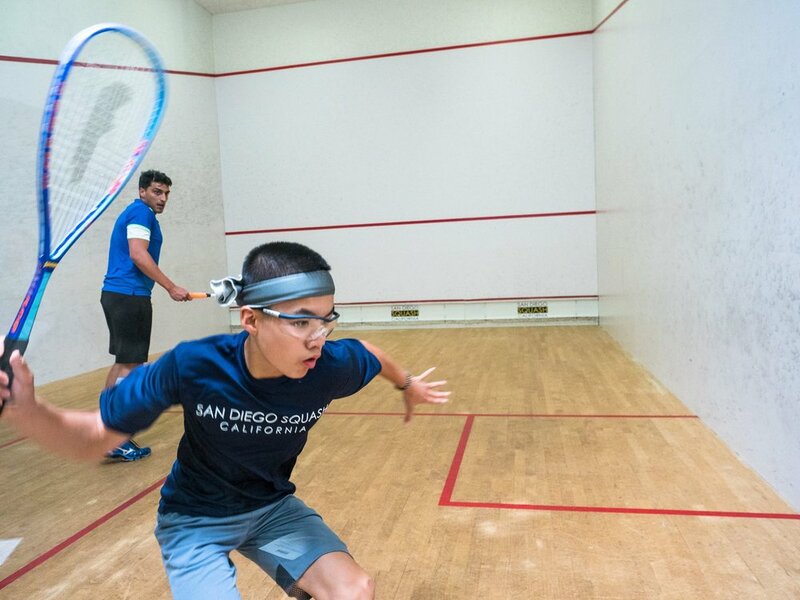 Squash Western Region Squash Championships being held in Irvine, CA next weekend. Thirteen of Arroyo Seco Racquet Club’s players traveled south and left their mark in the Junior Silver Tournament at San Diego Squash. The juniors took home top honors in four of the six tournament divisions. Fourteen year old Makayla Oas continued her run of success winning the Girls Under-15 Division and coming in second in the Girls Under-17 Division. Oas went 4-0 in her U-15 matches and 3-1 in her U-17 matches. Stay tuned for news on upcoming tournaments! The Feather Sports Adult Championships came to a close this Sunday afternoon. Yesterday’s players continued their run of success as they each finished first in their respective divisions. In the Women’s Open Final, Makayla Oas was victorious over Laurie Itkin winning 11-6, 11-8, 11-5. The tournament concluded with an entertaining Men’s Open Final between Alex Reynolds and Al Preston. Preston got off to a great start winning the first game of the match. However, Reynolds returned fire and took the next three games, including a come-from-behind victory from a 1-6 deficit in the third game. Alex Reynolds won the final of the Men’s Open Division (9-11), 11-5, 11-9, 11-7. Eric Lin stayed undefeated and claimed the trophy for the Men’s 5.0 Division with two additional wins on Sunday 3-1 and 3-0. Special thanks to all the friends and family who came out to support this tournament at the Bob Hanscom Squash Academy at Arroyo Seco Racquet Club. Subscribe to our mailing list for information on upcoming tournaments as well as special deals on Feather products! 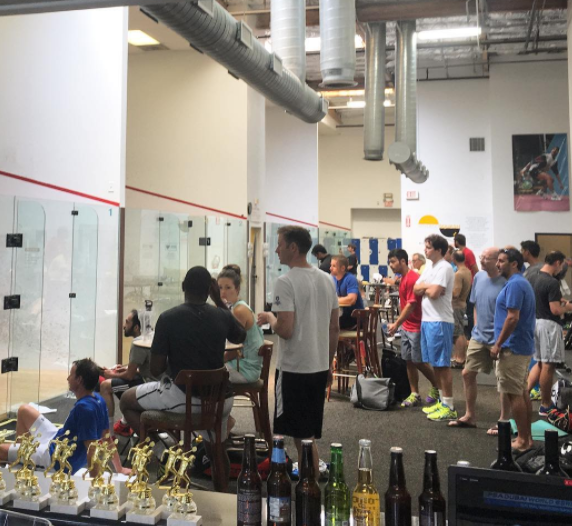 The Feather Sports Adult Squash Championships got off to a great start this morning at the Arroyo Seco Racquet Club in South Pasadena, California. Spectators at the Bob Hanscom Squash Academy provided a great atmosphere for the competitors. Makayla Oas looked impressive as she cruised to the Finals of the Women's Open Division without dropping a single game. Alex Reynolds ended the day on top of the Men's Open Division, winning both of his matches. Eric Lin was pushed to five games in the second of his two matches but remains undefeated atop the Mens 5.0 Division. Tom Williams put up a valiant effort but lost both of his matches in the Men’s Open Division. For the complete tournament scoreboard and scoring details please visit the Arroyo Seco Tournament Page. Check back in tomorrow to see which players bring home the ultimate prize at the Feather Sports Adult Championships. The 2017 Surf City Summer Championships took place at San Diego Squash facility this past weekend (July 28, 2017-July 30, 2017). The Surf City Summer Open is a social, fun, and competitive tournament for players of all levels. The tournament included a Saturday night party, a daytime barbecue at the club, a tournament gift for every player, and trophies for all the finalists. Feather Sports was proud to sponsor players who went on to have successful tournament runs in different divisions. Stay tuned as we follow our players on the road to the Feather Sports Adult Squash Championships at the Arroyo Seco Racquet Club, taking place on Saturday September 9th, 2017 and Sunday September 10th, 2017 in South Pasadena, CA. Subscribe to our mailing list for the latest news and updates from Feather Sports! Eric Lin (14 Year-old Junior player from Los Angeles, CA), won the 4.0 division in five games and was a finalist in the 4.5 finals. Left: Alex Reynolds (Arroyo Seco Racquet Club, South Pasadena, CA) was a finalist in the men's Pro division, playing long and tough five-game match. This video captures the scenes from The Fifth Annual Epstein Becker & Green, USSRA Men's Professional Squash Championships (June 27, 2004). The event took place in a pop-up glass court constructed at Macy's Plaza in Downtown Los Angeles. Feather Sports was proud to sponsor the event hosted by The Los Angeles Athletic Club. The semi final match-ups consisted of Patrick Chefunda vs. Karim Yehia and Stefan Casteleyn vs. Clive Leach. Watch the video to experience this unique tournament and see who took home the title! 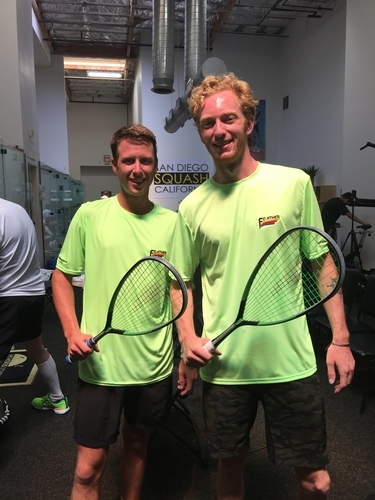 Feather Sports and Arroyo Seco Racquet Club (South Pasadena, California, USA) are proud to announce The Feather Sports Adult Squash Championships. The tournament is scheduled to take place from Saturday September 9th, 2017-Sunday September 10th, 2017. Deadline to register for the tournament is August 30th at 12:00 PM. Follow this link for additional tournament information. For more news about this tournament and more, please subscribe to our mailing list!